The Be Local USA Baseball Tee is a great way to rep your country! 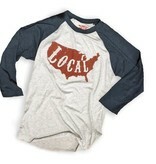 USA local graphic handprinted on a super soft baseball jersey (this is a unisex size shirt so order one size smaller). The color is heather-white with navy sleeves. The screen print is water based giving it a vintage look and soft feel. Tee is a cotton blend with an amazingly soft hand.